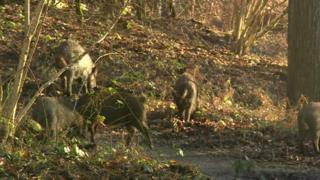 Two more wildlife rangers are being brought in to help "stop the growth" in the wild boar population in the Forest of Dean. The Forestry Commission said the number of rangers would rise from four to six as it wanted to bring the estimated population of 1,600 down to 400. It said rangers were also being trained to recognise African swine fever which is spreading across continental Europe. There has never been an outbreak in the UK but some pig farmers are concerned. Sophie Hope, from Gloucester, said a rise in wild boar numbers could increase the chances of her herd being infected if African swine fever spread to the UK. Ms Hope said: "It would mean a complete cull of the pigs here. There would also be a restriction in movement in and around the area. "There would be a shutdown of the countryside. It would decimate our business really." A Forestry Commission spokesman said: "We are increasing the number of professional, experienced wildlife rangers in the Forest of Dean...which will provide an increased resource to help stop the population growth and bring boar numbers down towards the target population of 400. "This is intended to reduce the nuisance caused by boar to the communities living in the forest." African swine fever is harmless to humans, but can be carried by both wild and domestic pigs. It is usually fatal within days, and there is no cure and no vaccine. A spokesman for the Department for Environment, Food and Rural Affairs said: "African swine fever has never been recorded in the UK but we are not complacent. "Since the spread of the disease in Europe, control measures have been put in place to ensure that no live pigs, wild boar, or meat products from affected areas reach the UK."